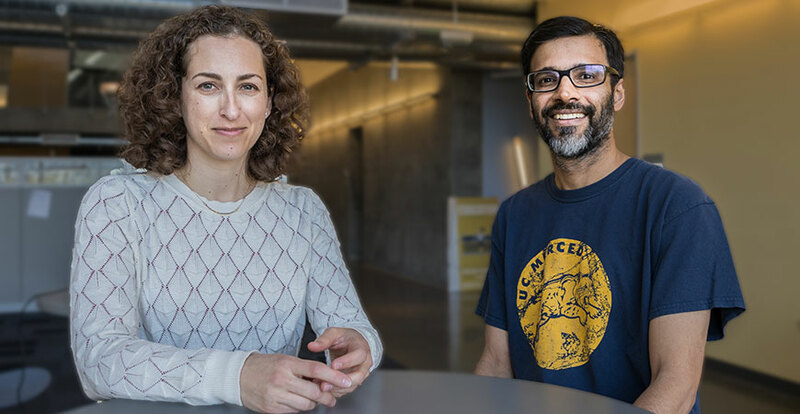 Professors Sidra Goldman-Mellor, left, and Harish Bhat are developing a method to predict firearm suicides. Professor Sidra Goldman-Mellor, a public health researcher with the School of Social Sciences, Humanities and Arts and the Health Sciences Research Institute, has teamed up with applied math Professor Harish Bhat with the School of Natural Sciences to sift through more than 44 million California hospital records, looking at patients’ basic demographics, visits, admissions and emergency-room visits and outcomes. Funded by a $10,000, one-year grant from the UC Firearm Violence Prevention Research Center at UC Davis, the researchers aim to design an algorithm that can tell clinicians what to look for among potential at-risk patients and who to target for interventions. The Centers for Disease Control found that national suicide rates have increased by 25 percent over the past 20 years, and 54 percent of all suicides are among people who had no known mental health condition. Often, those people were never diagnosed with such conditions, so they were never treated for them. “We feel sure there is a small but very important signal in all this data." Bhat said he had been looking for a project that involved human health but hadn’t found a “mathematically attractive” question until Goldman-Mellor approached him for this study. “This project lets me try to help figure out a public health problem without having to know deep details about human biology — there’s a pile of data and it needs to be analyzed,” he said. They will look at the hospital records for such information as behavioral patterns over time and repeat visits to emergency rooms and link them to state death records to find out who is dying and from what causes. Bhat will apply artificial intelligence and machine-learning principals to the problem. Part of the reason for that could be because this kind of research takes a lot of legwork. He’ll write new computer code to detect patterns and complex relationships among variables that help predict firearm suicides. In California, the number of gun suicides is lower than the national average and is only a small percentage of all deaths — California’s suicide rate in 2016 was 12.1 per 100,000, according to a news article in the Sacramento Bee. Bhat will explore new methods to amplify the presence of firearm suicides in the data set, a necessary step for machine learning. “We feel sure there is a small but very important signal in all this data,” Goldman-Mellor said. The answer will likely be a combination of risk factors, including previous suicide attempts. But even though most people who commit suicide have no history of mental health problems, the data might show increased hospital and ER visits along with primary or secondary diagnoses that indicate mental health issues. Both researchers said they appreciate the UC Firearm Violence Prevention Research Center’s support. Federal funding for the topic is unlikely because guns are such a political issue. The researchers agreed that their ultimate goal will be prevention, but that will take a clinical partner. They will also have to show the context of the artificial intelligence’s choices in interpretable visuals, such as a decision tree.